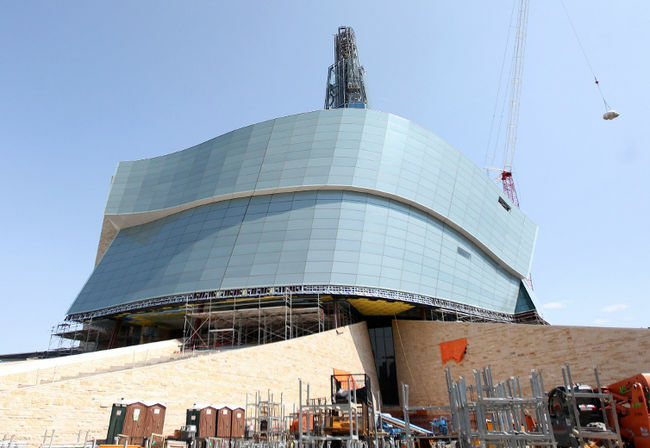 A Winnipeg teen — a foster kid in the care of CFS and who lives in a group home (when she decides to show up there) — won’t have to perform any community service or more youth jail time after she and three others broke into the under construction Canadian Museum For Human Rights this summer and defaced it with gang graffiti. However, the 15-year-old didn’t escape a polite haranguing today from Judge Sid Lerner, who noted the irony that someone who comes from a troubled First Nations background would elect to deface the CMHR. “The human rights museum is not just something the city is proud of, although the city is certainly proud of it,” Lerner told the girl, who has been at the youth jail since mid-September after she didn’t turn up at ‘home’ until 4 a.m. one morning, well outside of her curfew. “But it’s also something that deals with issues that have affected all sorts of people, all sorts of minorities, including aboriginal people — so it’s ironic, it’s unfortunate of all places that this would have been the place that you and your friends would have chosen to damage. Because its goal is to develop understanding,” Lerner said. Buzzed on a large plastic bottle of Stone Cold beer, the girl and her compadres busted past the CMHR construction fence and used ladders lying around to get into the $300-million plus facility. Once inside, they used spray paint to glisten the walls with slogans such as “MW” (ostensibly Manitoba Warriors), “1323” and “MWTCA,” Lerner was told. The group then entered a staff area where they rifled through some safety jackets and stole a camera before taking a number of fire extinguishers and shooting them off at each other. A security guard heard the commotion and called the cops, who nabbed them all inside the fenced compound. She had no prior record — and likely wouldn’t have spent a day in jail for her actions if she hadn’t twice thumbed her nose at community release conditions police put her on. The Crown, mindful of the fact there was no basis under the YCJA to jail her, asked Lerner to give her a shot of community service to reinforce in some way the ideal of civic pride the CMHR is meant to represent. Lerner refused, saying he had to account for the pre-trial detention she had served, as well as the year-long period of probation she’ll now be on. Little about the girl was disclosed other than she was only just recently brought into care for an unstated reason, is considered “very vibrant” but yet unsettled. I respect Lerner’s decision, but have to wonder whether he shouldn’t have honoured the Crown’s community service request. If one subscribes, as I do, to the belief that people more often than not learn by doing, then asking this young scofflaw to give something back to the community she wronged would likely do more to instil in her the gravity of what she did than a year of supervised probation. Community service work — even 20 hours’ worth — could be crafted to put her in contact with some who could teach her why her actions were offensive, why gang tagging a soon-to-be human rights museum, (at least to me) is maybe a three-quarter step shy of defiling a church. It’s insulting to donors and taxpayers footing the bill for the project. We should forgive the girl, yes. But make her at least work a bit for that forgiveness.